french toast | Run. Write. Therapy. Life. I’m Fine The Way I Am! 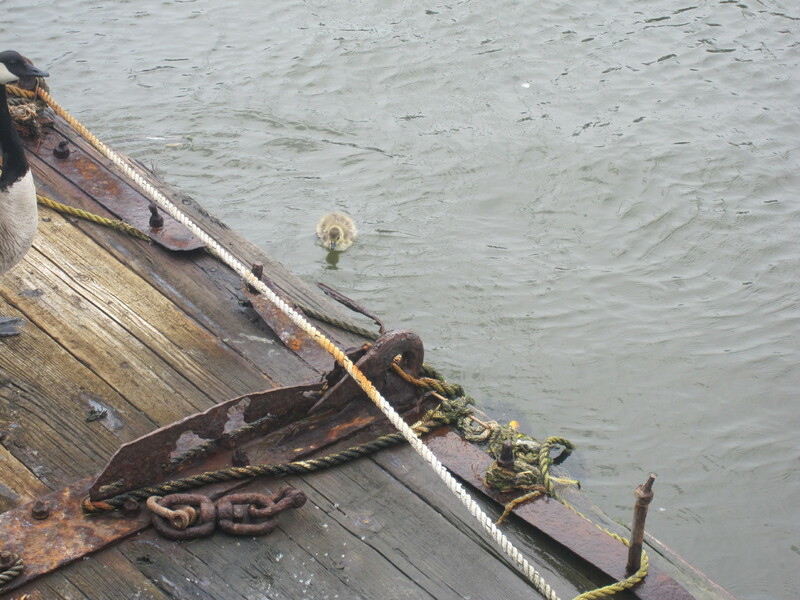 Today’s Happy Note: Boats! I was going to go kayaking but it was too windy. Instead I just walked along the river and admired the boats. Beautiful boats! Went for two strolls today. 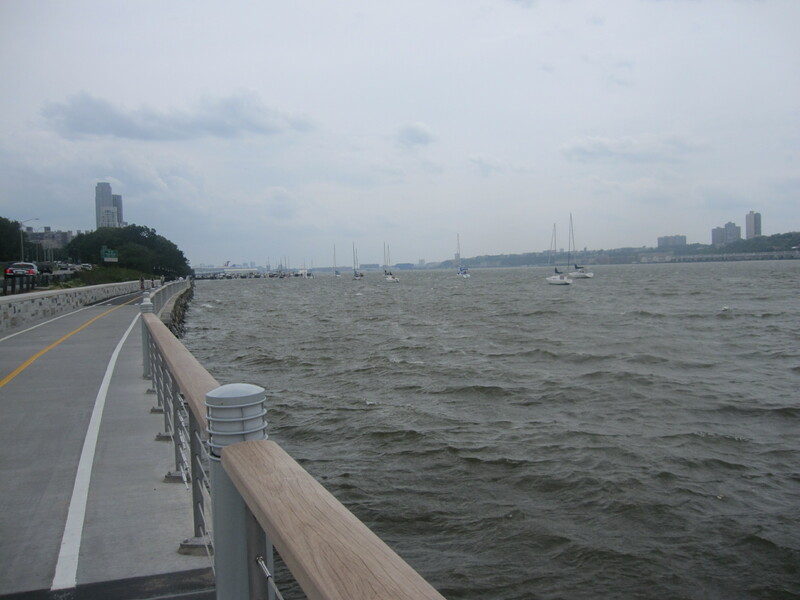 Very windy — I had to walk backwards for a while! It’s nice to have one day of the week where I don’t do any formal exercise — no yoga class, no run, no lifting weights. Nothing planned. Obviously, walking helps clear my head and gives my body a break from more intense activity, but having one relaxing day like this per week also helps me remember that I’m okay the way I am. About a year ago, I remember telling my former therapist that I knew I would be perfect and finally happy if I lost 5-10 nagging pounds. She asked me to describe how my life would be different if I lost weight (that doesn’t really need to be lost anyways). The only thing I could come up with was that I thought men might pay more attention to me. Um, really Caronae? Do you really want men to pay attention to you because of the minute details of your body and weight? Or do you want them to notice how much you know about history or how passionate you are about running and writing or your deeply compassionate personality? Christina just wrote about this at Eat The Damn Cake. I read the post last night and my walks today helped me internalize what she said and what I do, deep down, believe: I am fine the way I am. So simple yet so huge. Weekend brunch/breakfast is and always will be the best meal of the week. I try to do something I wouldn’t do on a weekday (oatmeal, smoothie, yogurt, cereal). It’s glorious to sit down in a sunny kitchen with a morning meal that I feel like I’ve actually created and read the newspaper (or blogs). No rush. Nowhere to go. 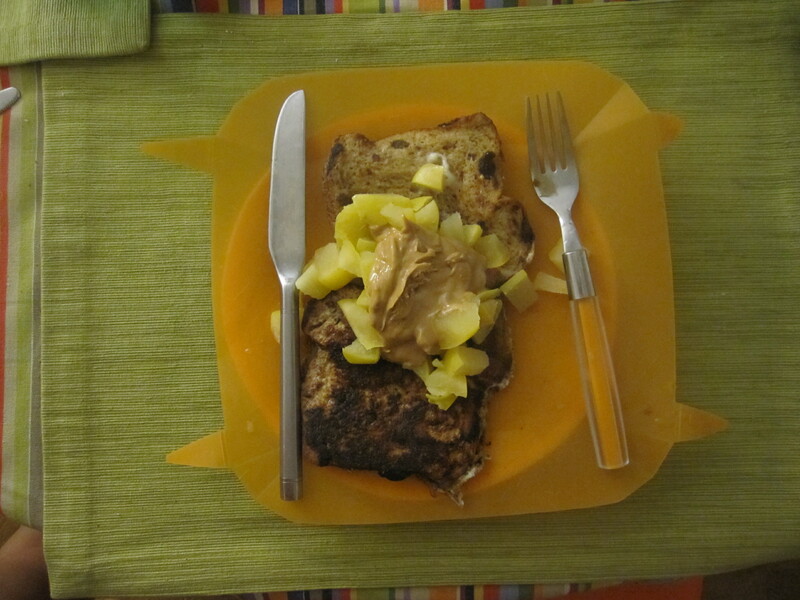 Today I did a cinnamon raisin bread French Toast with apple and peanut butter. 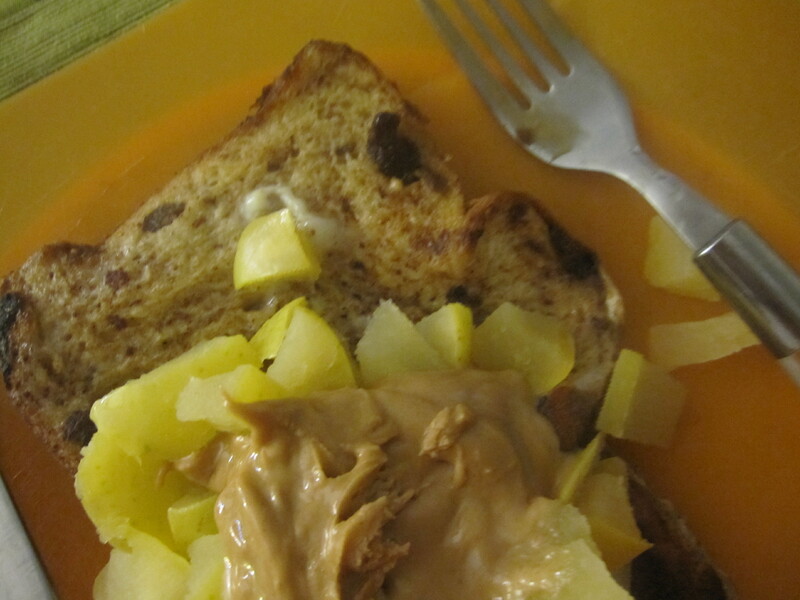 Doesn’t the peanut butter look like it’s making a little blanket over the apples? Like it’s keeping them warm? 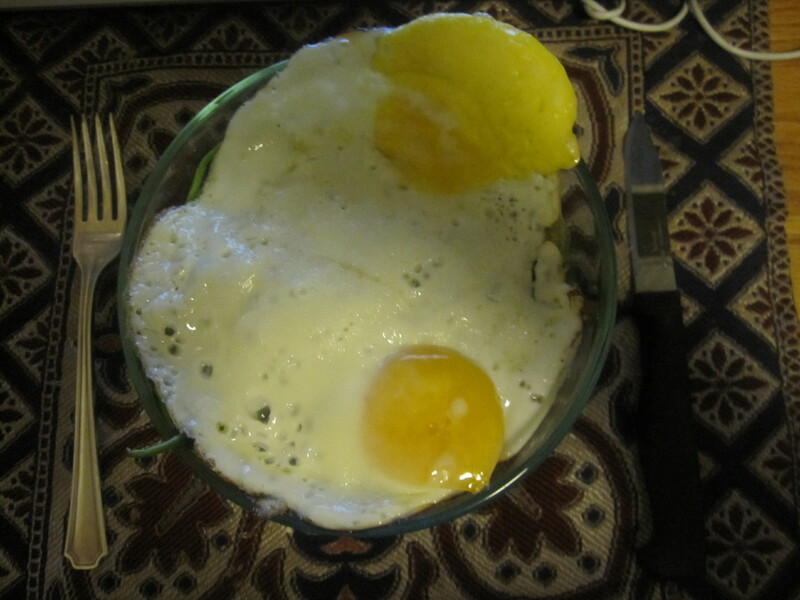 I actually used some peanut butter oil/drippings in the egg batter. I couldn’t really taste it in the finished product though. Fun fact: I got a basil plant (!) at the farmer;s market yesterday. His name is Balthazar Basil and his sister on the windowsill is Fanny Fuschia. If you didn’t know I was weird already, now you know I’m extra weird. 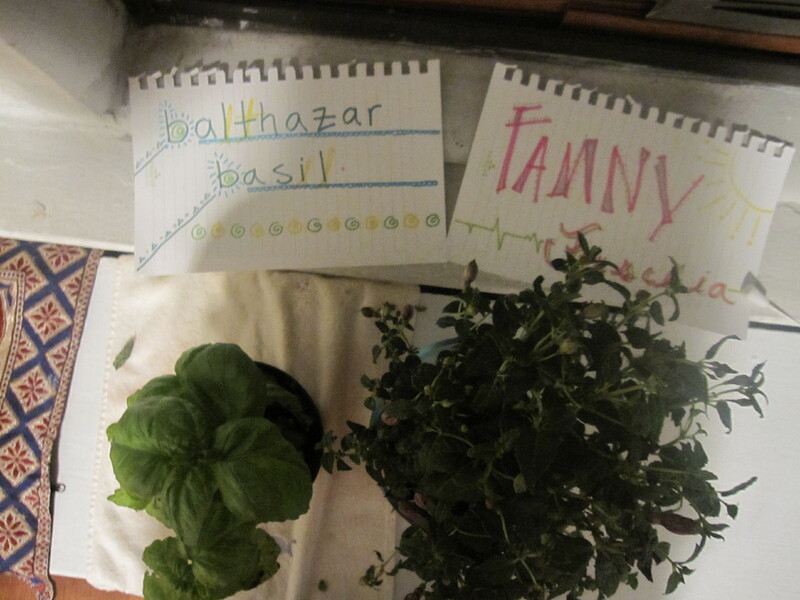 Like, I-name-my-plants-and-make-pretty-signs-for-them weird. Hey, it was a fun art project! Basil is my favorite herb. Least favorite: cilantro. Although, unlike most cilantro haters, I don’t think that it tastes like soap. I just don’t like it. Dinner was fun and easy! I call it Lazy Girl Tacos. 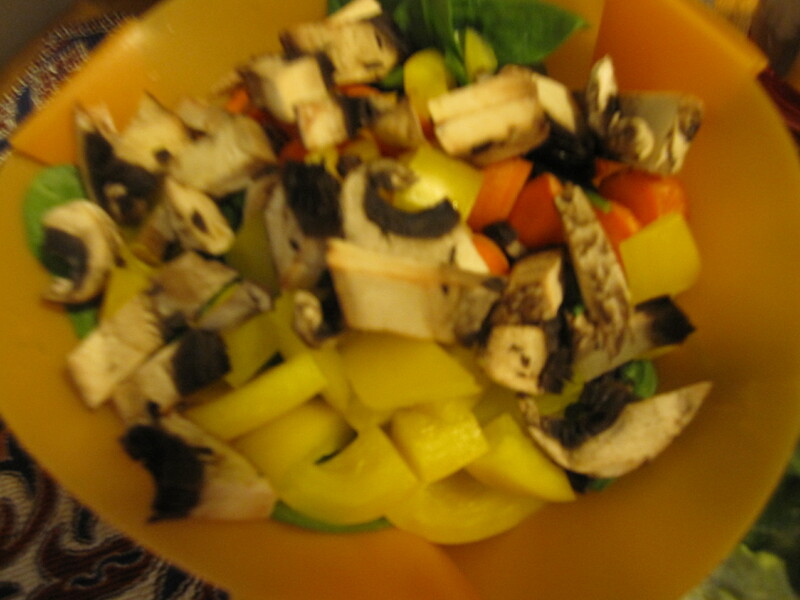 Steam vegetables in microwave (you could use other veggies as well) in a few inches of water for two minutes. Remove and drain excess water. 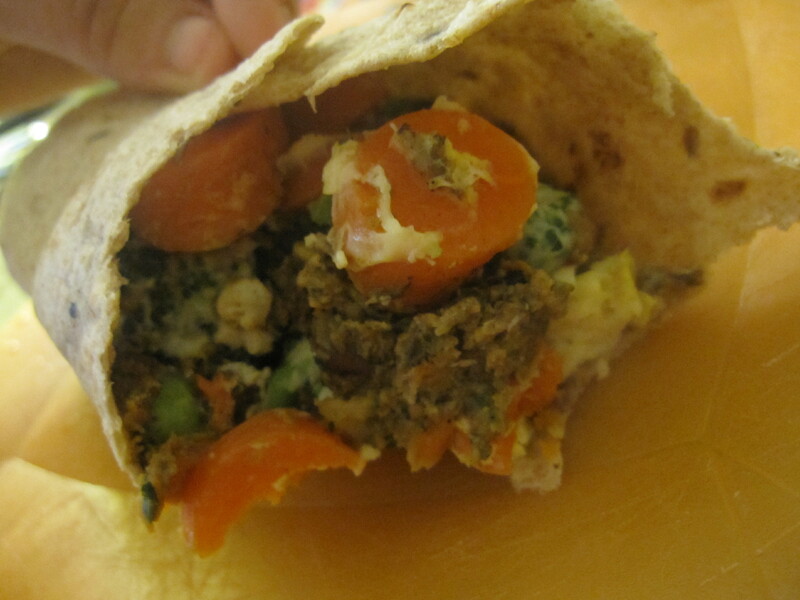 Add veggie burger and egg. Cook entire mixture for another minute. 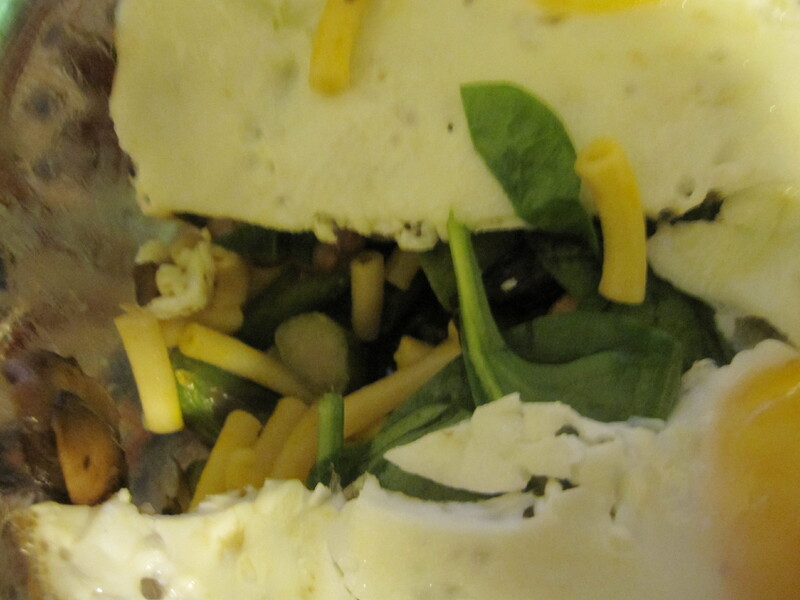 Remove and break up burger and mix entire mixture thoroughly. Heat one more minute. 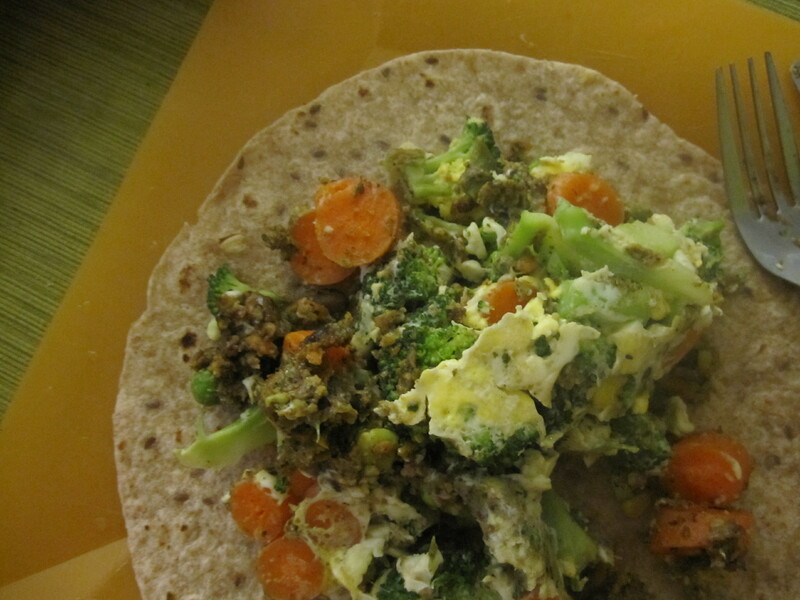 Remove and place on tortilla. Consume. Not sure why this works so well given the five random ingredients, but I think it’s amazing. It really is very taco-like! TLC (Oreo and peanut butter flavors). Light and pillowy. 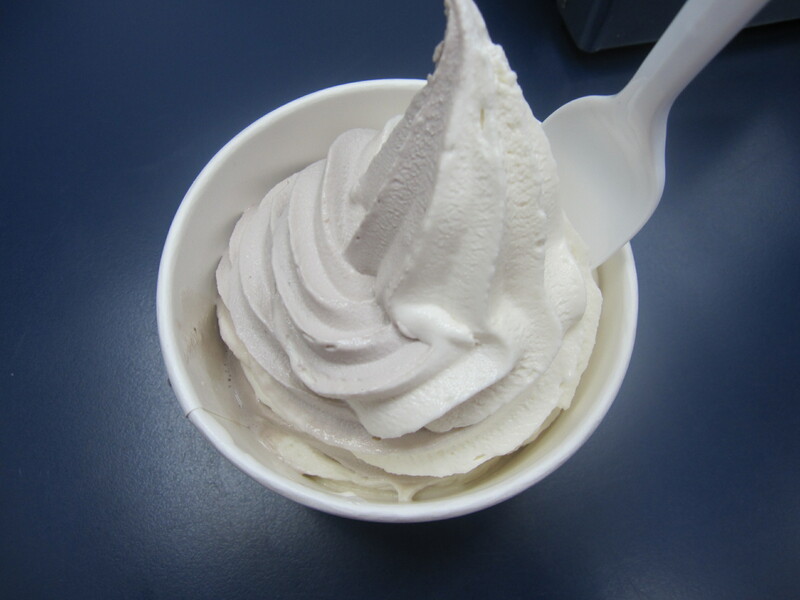 Makes me feel like I’m eating a cloud! 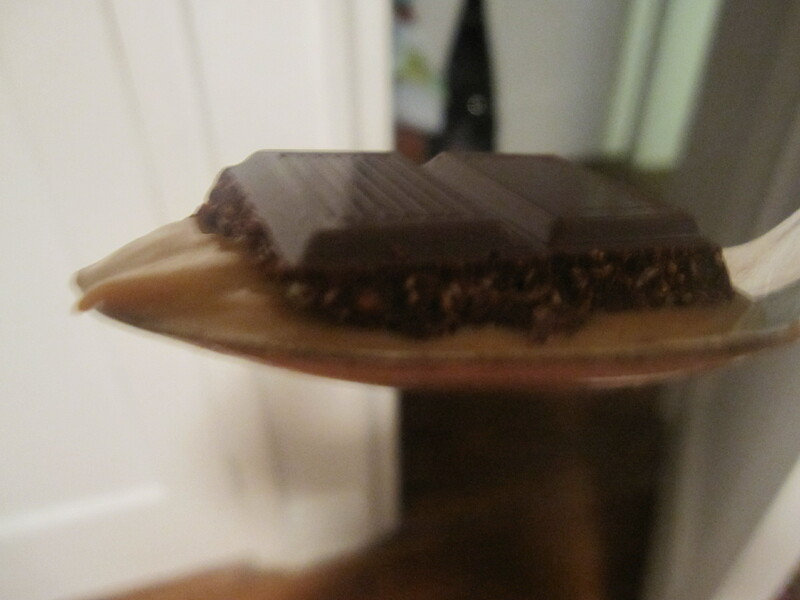 Dessert #2 (just wanted a tiny something before blogging/bed). 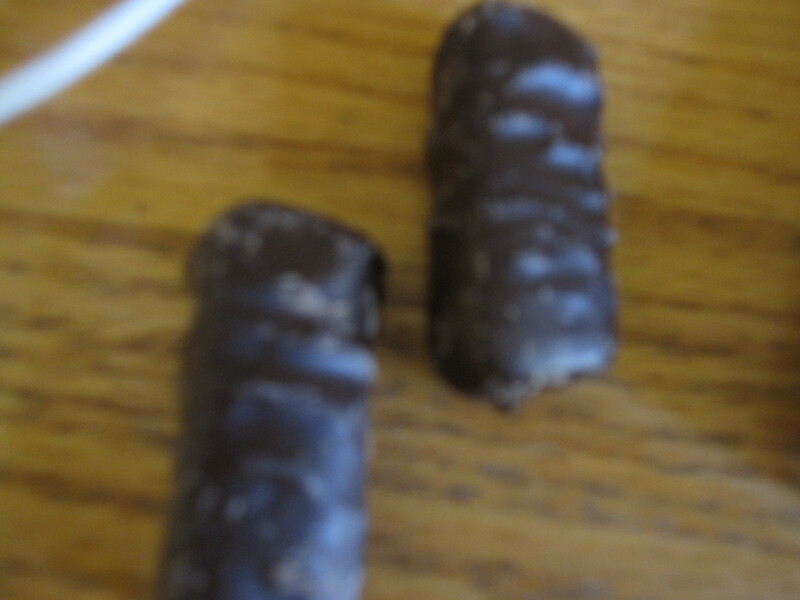 It is one of my core beliefs that you can never have too much peanut butter and chocolate. They’re a woman’s best friend. Hoping to squeeze in a CP run tomorrow morning — I haven’t run the main loop in a few weeks! Tomorrow is a very busy day and I’m hormonal. Let’s hope I don’t get too crazy and bite someone’s head off. So much for the “compassionate personality” I mentioned above. Oh, and my L is on vacation this week. Hopefully I’ll survive. Do you feel like there is something wrong with your body the way it is? Or have you learned to let go and just be at peace with things? I think that, for individuals who are not dangerously overweight or having health problems related to lifestyle, it is actually healthier to just accept ourselves. I have expended so much mental energy hating myself. Now, I put that energy towards doing things I like! Goodnight and have a fabulous Monday! Today’s Happy Note: Going to the Cathedral and listening to the organ in honor of my mother! Happy Mother’s Day Mom! I love you more than I could ever say. You are strong, beautiful, caring, and dedicated. I hope that one day I might be a fraction of the mother you have been to me. Speaking of mother’s day, go say congrats to Heather and her new little HEABlet! There aren’t a lot of things that I claim to know in this ever-changing world. But I do know this: I will be a mother some day. I know it more than I know almost anything else about myself. I don’t know where my career will go, where I will live, who I’ll be with, or even some of the more nuanced details of myself: but I know that I have to be a mother. It’s sort of strange how strongly I feel this. Does anyone else feel this way? Exercise: I had a short and sweet five mile run this evening. Although I felt good, the weather did not seem to agree with my mood. It was seriously blustery! 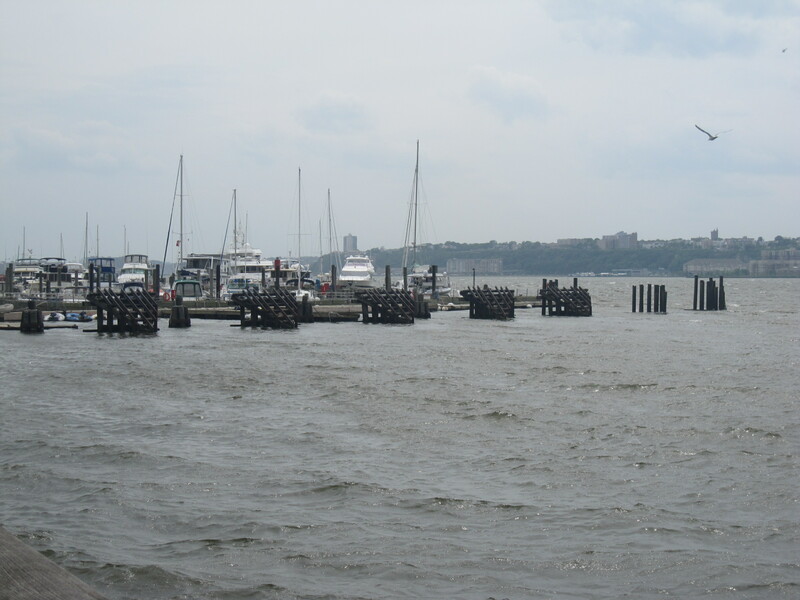 I was running north along the Hudson River and was a little bit afraid that the wind would blow me into the water! I also did 20 minutes of yoga, making up my own poses and doing some core stuff along the way. I love doing balancing flows. Today I did a lot with airplane, standing splits, half-moon, dancer’s, hand to foot, extended hand to foot (leg out to the side), and headstand. Balancing poses seem to reorient me and calm me down. Eats: Eats were actually pretty fun today! Don’t expect anything too thrilling for the rest of the week though. I’ll be working my way through my “pantry” (a very disorganized plastic bin) which has a lot of random stuff in it. 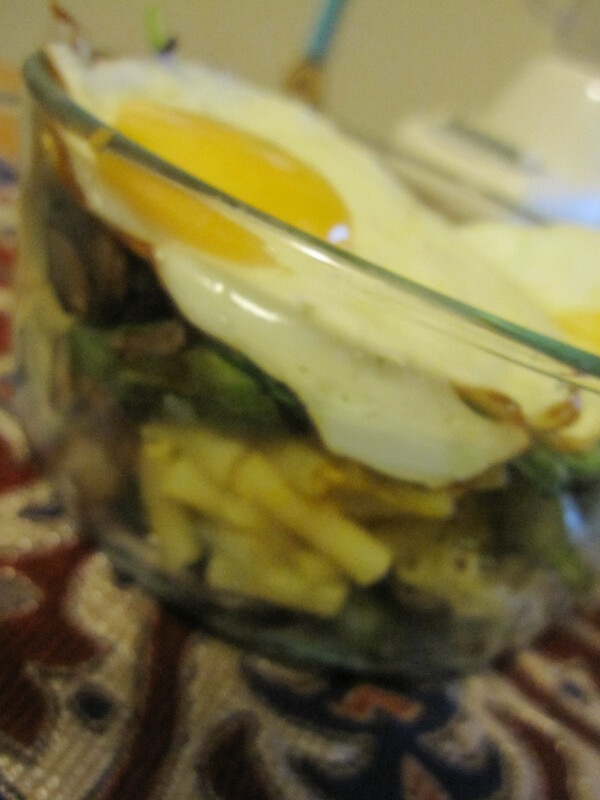 Although random food supplies seem to bring out my creative culinary side (exhibit A: tonight’s dinner). Anyways, breakfast today was extra special! I love weekend brunches — they are my favorite meal of the week to make and eat. 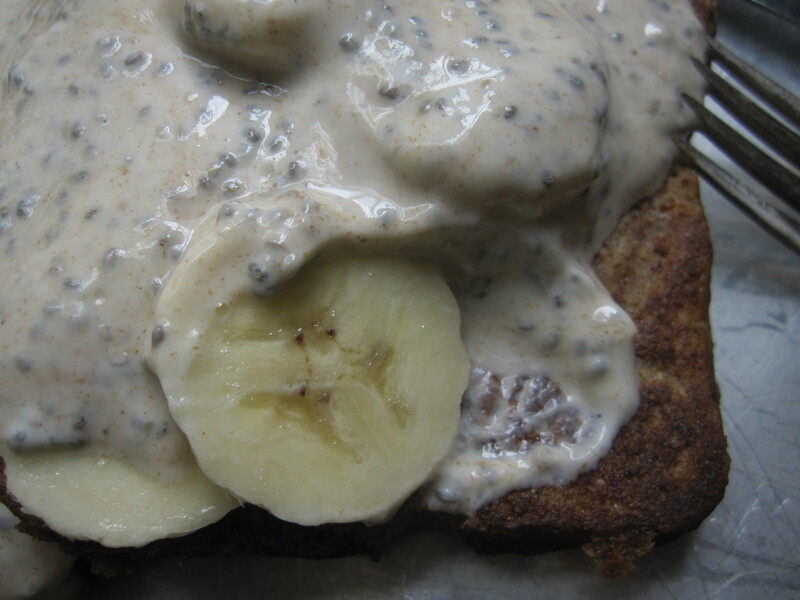 Banana maple chia french toast! Heat coconut oil in a pan on medium-high heat. Prepare toast “bath” (egg white, half of cinnamon, and milk). Coat both sides of each slice in the mixture and cook in pan (about 5-6 minutes). 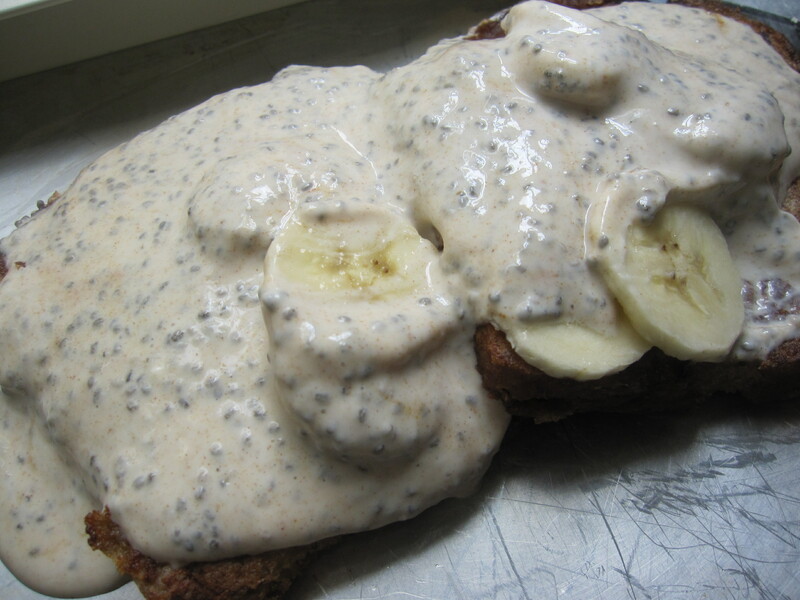 Meanwhile, mix yogurt, maple syrup, more cinnamon, chia, and banana. 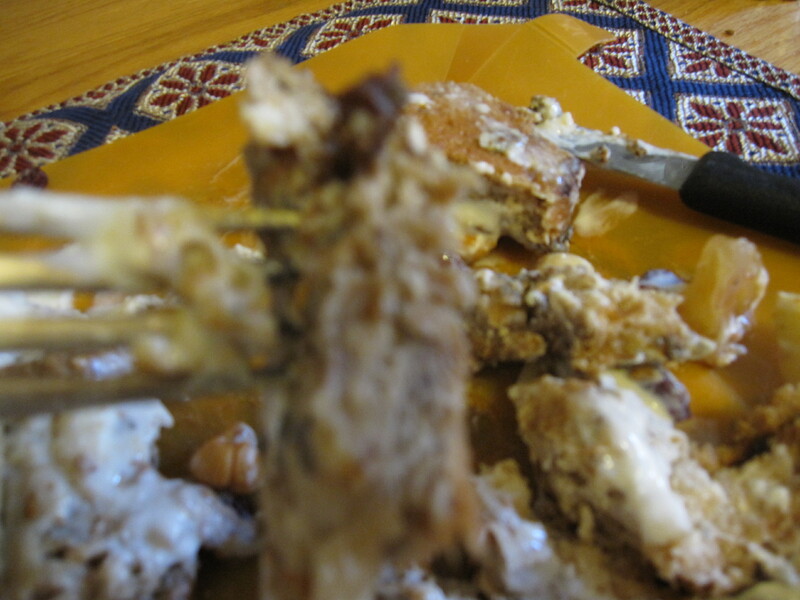 When french toast is cooked through, plate and top with yogurt mixture! Purely, simply delicious. 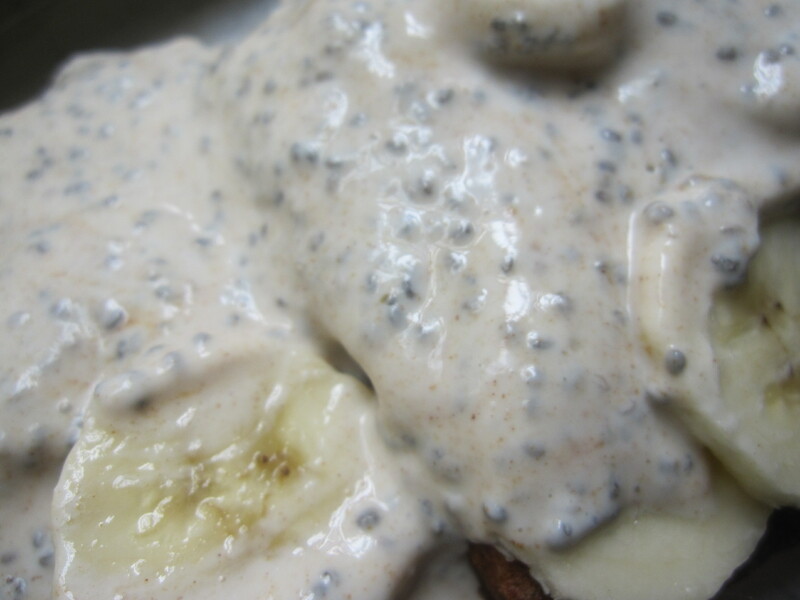 The maple syrup really takes the plain old vanilla yogurt up a notch in terms of flavor and the chia seeds give it a nice texture. 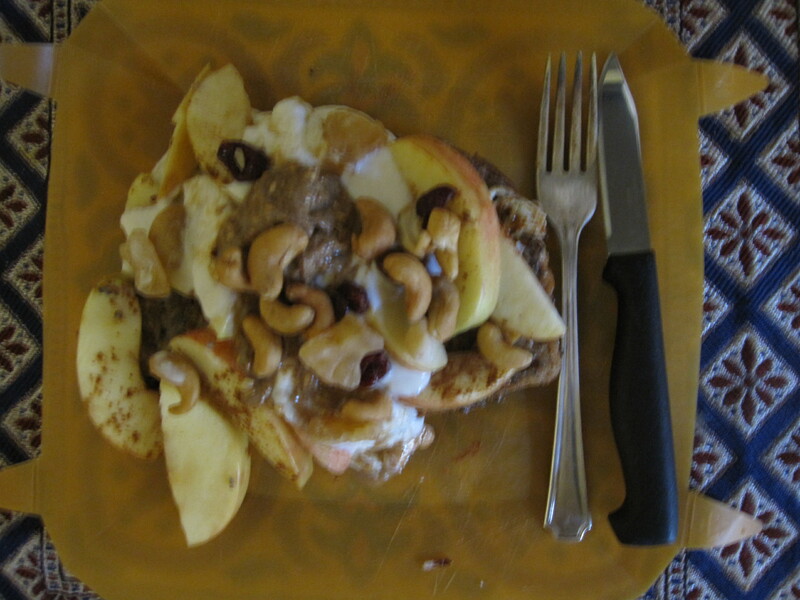 Topped with almond butter and pomegranat chobani. 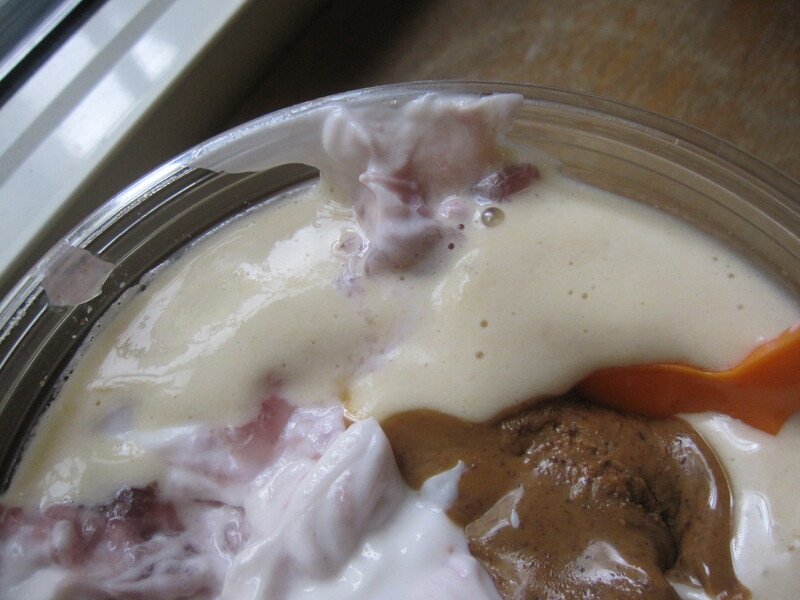 For some reason, now that I am obsessed with SIABs, I cannot stand to eat my smoothies without toppings anymore! Dinner was also fun. 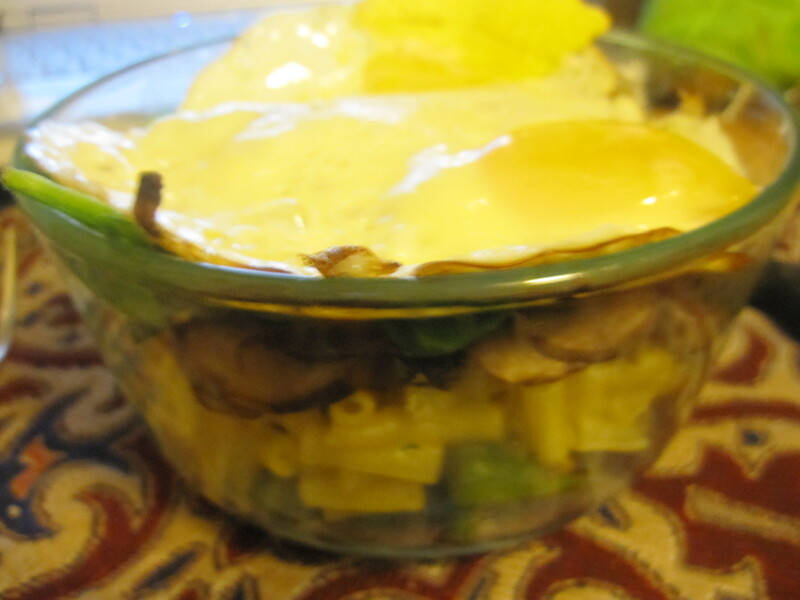 It was basically a casserole with layers of sauteed asparagus and mushroom, macaroni and cheese, more asparagus and mushroom, fresh spinach, and fried eggs. Below is a little diatribe I wrote after reading a certain article in Oprah magazine this month. I’d love to hear your thoughts! In my monthly reading of Oprah magazine this weekend, I came across an article that disturbed me. I felt unsettled as soon as I began reading, and quickly realized why: the entire premise of the article is that women’s bodies necessitate correction in order to be beautiful, particularly as we age. Don’t get me wrong, I’m not some super ultra-feminist who rages against makeup or push-up bras or anti-wrinkle cream. Women deserve to feel beautiful, but that begs the question: to what extent? Where is the boundary between natural beauty and technological beauty? Furthermore, what about the idea that beauty is on the inside? Most women’s magazines seem to push this fact, but they also relentlessly remind us that we need our abs to look this way or that we need this new haircut. I think that this particular article, which talks about the “fantastic possibilities” that will emerge in the field of women’s beauty and style in the next decade, reimagines the female body and places it in an unattainable context. This strikes me as dangerous because, through a pervasive focus on correcting the outside’s of our bodies, I worry that we ignore the insides. And I am not just referring to the fluffy “I’m a smart, beautiful, kind woman with a good personality” stuff. Our insides are serious markers of our true health. By masking this more and more, I worry that we are distancing ourselves from the natural frameworks our bodies have established to maintain our own health. The article I refer to is entitled “Stop Grays With a Pill, Melt Fat With a Laser: And 12 Other Fantastic Possibilities that might be fully realized by 2020”. It can be read online here. Basically, the article profiles some slightly disturbing “health” innovations. And by profiles I mean “obsesses over”. From a magazine as empowering and insightful as Oprah, I would have expected a much more two-sided portrayal of things. For example, one of the items I found most upsetting was entitled “A Slimmer Waistline, Trimmer Hips — No Surgery Necessary!” It described a device that works like an ultrasound to break up fat in any desired area. 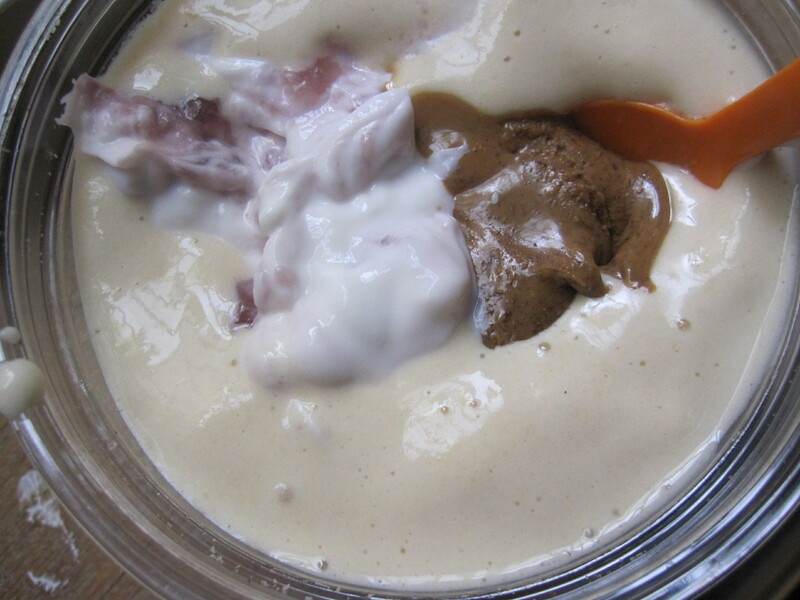 Once the fat has been broken up the body flushes it out naturally. It can remove 2-3 inches from the waistline. As mentioned earlier, I find this problematic for two primary reasons. First of all, why can’t we leave the female body alone? I find it quite distressful that, as technology becomes more and more developed, we insist on applying it to our bodies. Isn’t this somewhat invasive? I would like to think that there is still one personal, sanctified space in this world — my own body. Do I really need to take a pill ensuring that I never get grey hair? Or use at-home laser treatments to remove the “unwanted” hairs from every part of my body? One of the innovations mentioned refers to a sort of improved botox whereby or own blood and proteins are used to fill in wrinkles. Really? I think women in their natural state are gorgeous. Granted, I may think otherwise when I’m sixty, but nonetheless, I hope that I would have the courage to realize the beauty in my health, intelligence, and ability to move and dance and play. I think these things are beautiful; not artificial mechanisms whereby we bizarrely rearrange the body in the hopes of making it more appealing to who? The second reason I find these innovations problematic is as follows: let’s imagine a hypothetical woman who has employed these innovations. She has no love handles, a wrinkle-free face, thick hair, perfectly white teeth, and firm skin. Regardless of whether or not we might think of her as “beautiful”, there are dangerous health implications. What about exercise and healthy eating and meditation? All of these healthful practices can be thrown away when we correct the external body with such a fine-toothed comb. I am not saying that every woman who chooses to use these technologies will let her health go to the wayside, but I do worry that such inventions could mask real dangers. For example, many sedentary woman could become relatively thin by removing several inches of fat from their stomach, hips and thighs. But this does not mean that their hearts are any healthier or that their lungs or any stronger or that their bones are not withering away inside. Ultimately, I think these new conceptions of beauty create a risky divide between internal and external dimensions of health and beauty. I think that the internal and external dimensions are intertwined — and are meant to be so. When I lift weights, I tone my arms and stomach. But I also help keep my bones dense and build confidence and self-esteem. I think it is morally incorrect to create a separation here. My own mother, who is in her fifties, is vibrant, radiant, powerful, and compassionate. She hikes, gardens, bird-watches, plays word games, kayaks, skis, works, and loves. To me, this is beautiful. The (few) wrinkles around her eyes are signs of a lovely journey, not signs of an ugly body. When will we learn to appreciate this? I only hope that we can see the beauty in the natural female body before we have gone too far down this dangerous path of reconstruction. So, Oprah, I am highly disappointed in you here. While I applaud you and the health innovators who are coming up with ways to make us truly healthier — like finding ways of increasing access to fresh fruits and vegetables among people in impoverished communities — I do not think that these devices, mechanisms, and ideas constitute true health. I hope you will forgive me when I say that I found this article unpleasant, upsetting, and an offense to healthy, beautiful women everywhere. Today’s Mini Goal: Wash my sheets. I HATE doing this because I only have one set, but it definitely need to be done. Ick. I made it through an exhausting, but satisfying, 15 miles this morning! Glad it’s done with. Now tomorrow I only need to do ten. I basically looped around lower Manhattan, running through a ton of different parks — Riverside North, Riverside South, Hudson River, Battery City, East River, finally ending up at Union Square. My legs were definitely dragging the last few miles, but I felt pretty good for a majority of the run. Not enough fuel, perhaps? It wasn’t one of those runs were you feel like you’re flying, but there were clear moments when I felt strong and fast, and in the moments when I felt sluggish I still tried to push myself. Long runs are probably my favorite type of run — I take a looonnggg time to “get going”. Usually I only start to feel warmed up after about three miles and start to feel good around five or six. I ran track my first few years of high school, and the only time I ever beat any of my running partners was at the end of a hard workout. I have a kick. Even then, as a fourteen year old, I knew I wanted to run marathons someday. I guess it’s kind of cool that now I get to follow through on a long-time dream! I’m reaalllllyyyy hoping to get into the NYC marathon. Pray to the distance-running Gods for me! I was curious to notice what/how much I ate today, so I documented everything. I am trying not to be judgmental. I genuinely just wanted to know what I was putting in my body after such a big workout. I have always enjoyed running, but for a long time I used it as a control mechanism (i.e, “I can eat x amount of food if I run x miles”). I think I have a pretty healthy relationship with both running and food at this point in my life, but it hasn’t always been this way. I haven’t really talked about my relationship with food on the blog much because, honestly, I have been a bit afraid. But after reading everyone’s stories and feeling like I’ve made some genuine blog friends who won’t judge me (hi EE! hi Stef! 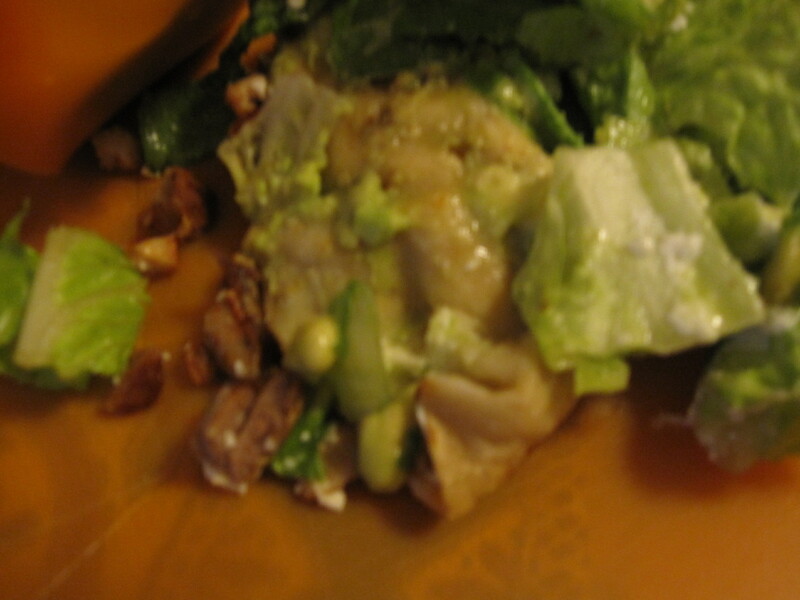 ), I feel like, being that this is sort of a food blog, maybe I should talk about this! From the time I was fourteen or so until I was about nineteen, I hated my body. It got worse when I started college (I was 17), and came to a point where I woke up every day dreading looking at myself in the mirror. I used many coping mechanisms; mostly I just punished myself by staying in my room and crying all the time. I was not one for self-injury or a clear eating disorder, but I undeniably was injuring myself emotionally and had disordered eating. I think the point when I realized I had a serious body image issue was (roughly) the fall of 2008. There was one week when I only let myself eat one thing each day — an apple, for example, or a mini muffin. I still drank some things (milk, orange juice, tea) to get me through my workouts, but it was horrible. For the next eight or ten months, I would go through days or weekends where I deprived myself, but I made up for it the rest of the week; I never lost weight and was always irritable. Now, if I feel like I have either eaten too much or too little on any given day, I get anxious and upset. Sometimes I get so hungry on long run days and I am afraid that if I respond by eating a lot (even if it’s healthy, whole foods), I will gain a lot of weight overnight. So I decided to simply notice what I eat today and make no judgments about it. I want to make sure I have plenty of healthy, nutritious foods, and I also thought it would just be interesting to have a record of how much I need to eat on a long run day. So here goes! 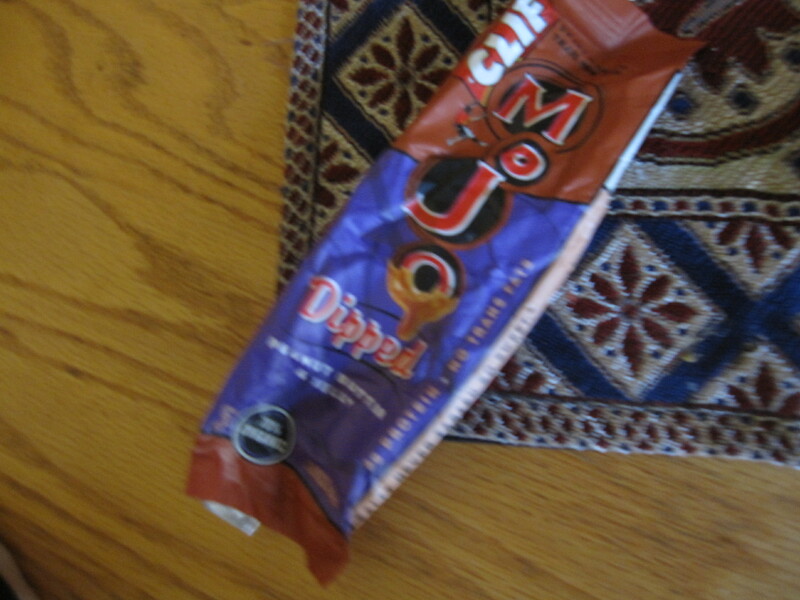 Pre-run banana and mid-run mojo bar. 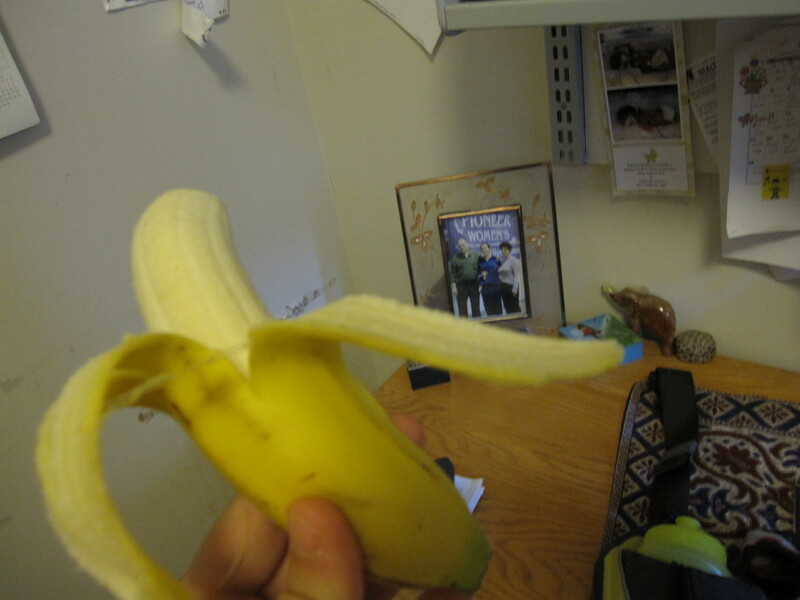 I can’t eat a full breakfast before running, and I have found that a plain banana is perfect. 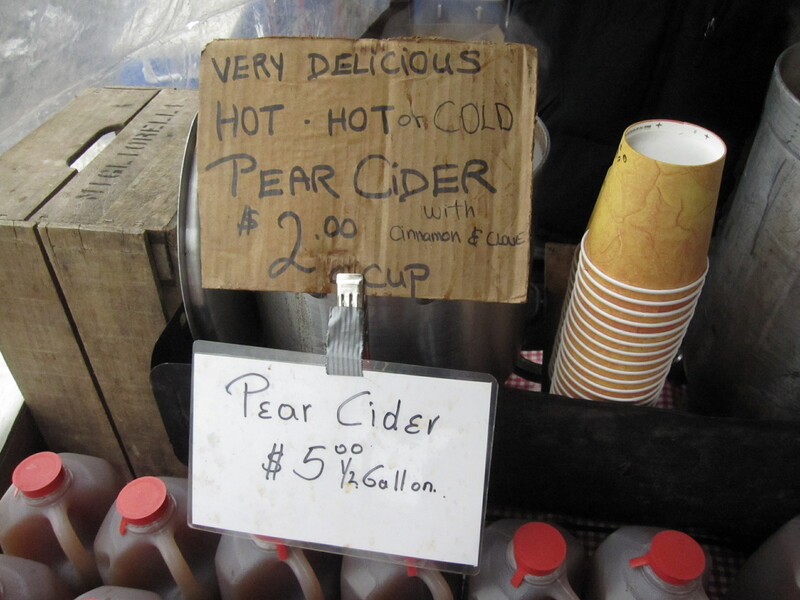 Cup of pear cider at the farmer’s market (I had finished my run there). Delicious! Also had a random smoothie sample from TJ’s. 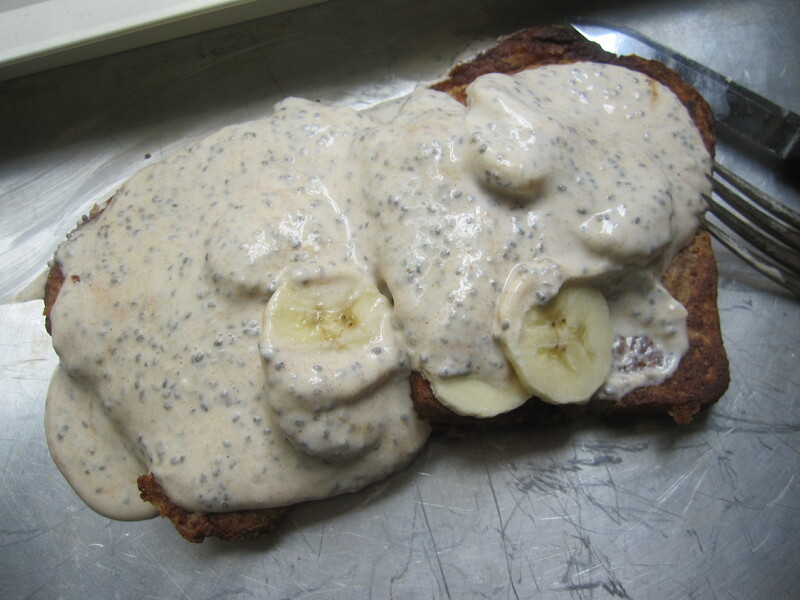 So what is this giant pile of deliciousness, you ask? French toast! I started with two pieces of fresh cinnamon raisin bread and dipped them in a bath made with one egg, chia seeds, cinnamon,maple syrup, a splash of milk, and coconut oil. 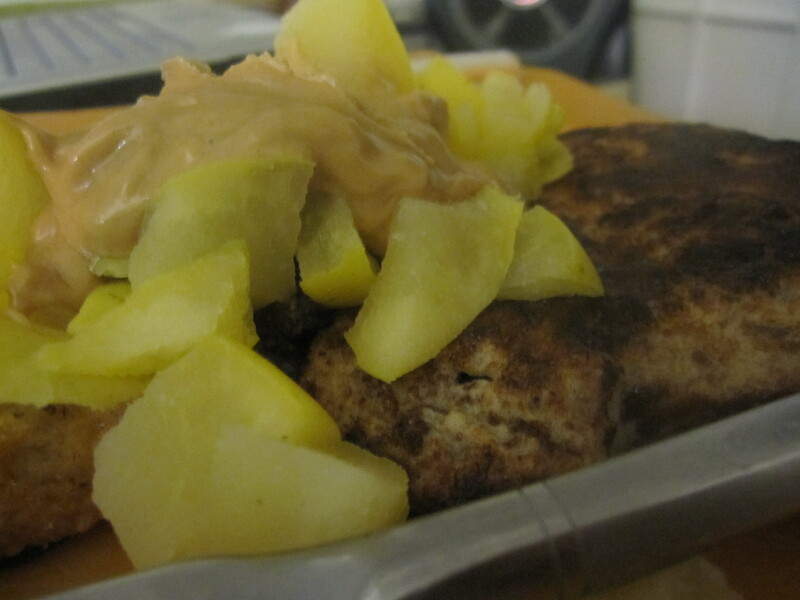 I cooked them in a bit more coconut oil and threw some apple slices in the pan to caramelize up a bit. 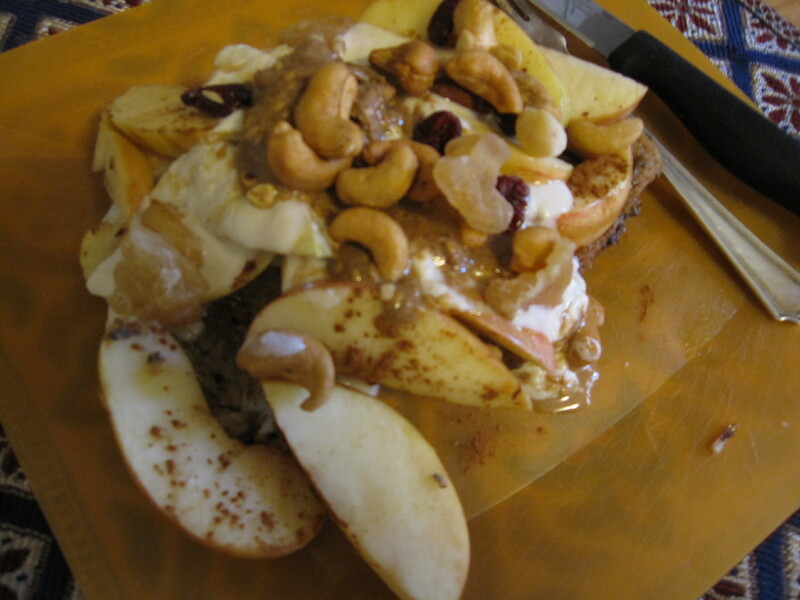 When all that was done I plated it and topped it with a bit of maple-vanilla yogurt, almond butter, more cinnamon, and a sprinkle of random trail mix. Definitely not a low calorie brekkie, but this was a brunch. 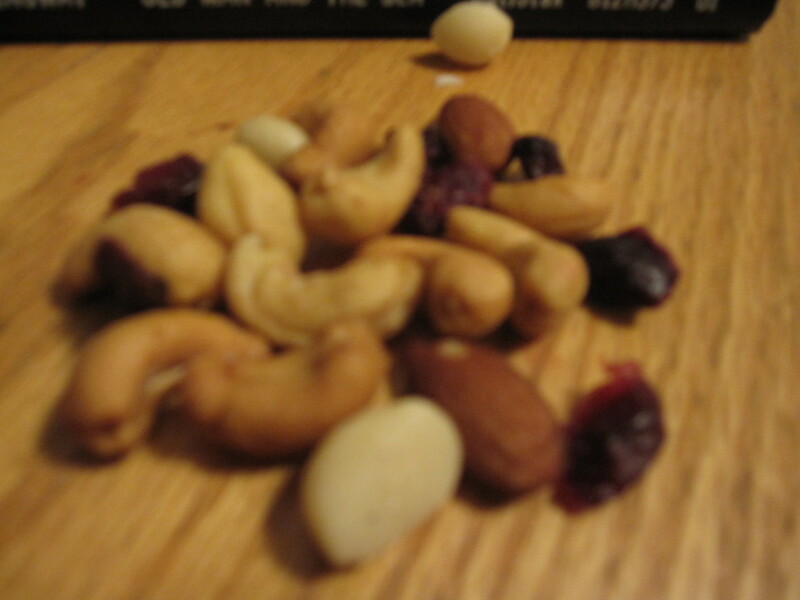 Afternoon snackage: more trail mix and a forkful of pb for good measure. I honestly was not that hungry in the afternoon at all. 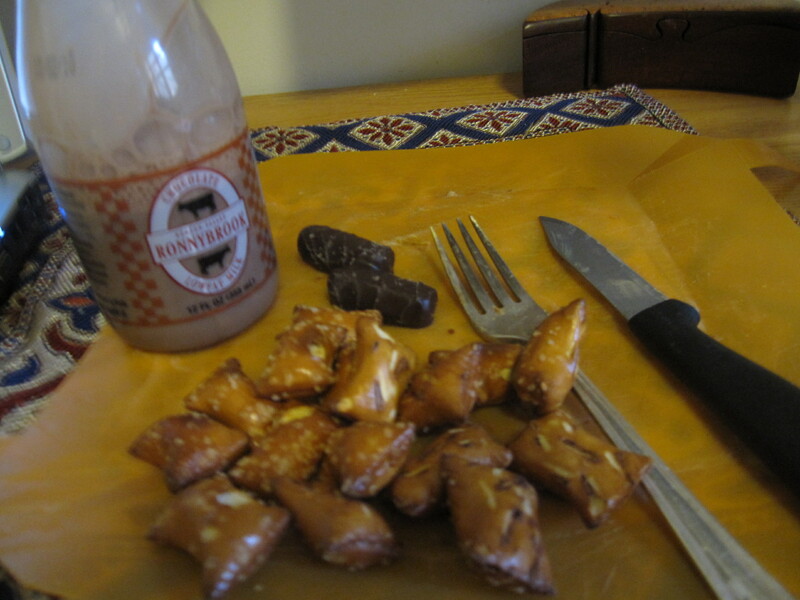 Chocolate raspberry sticks, pb filled pretzels and half a container of chocolate milk also made an appearance in my day! 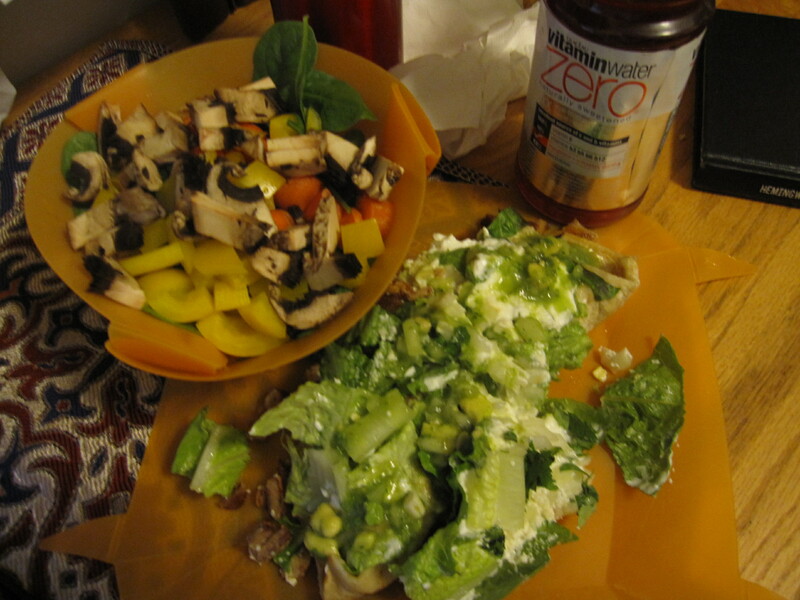 Dinner was a side salad of spinach, yellow pepper, carrots, and mushrooms with a GIANT chicken quesadilla, buried under that lettuce. 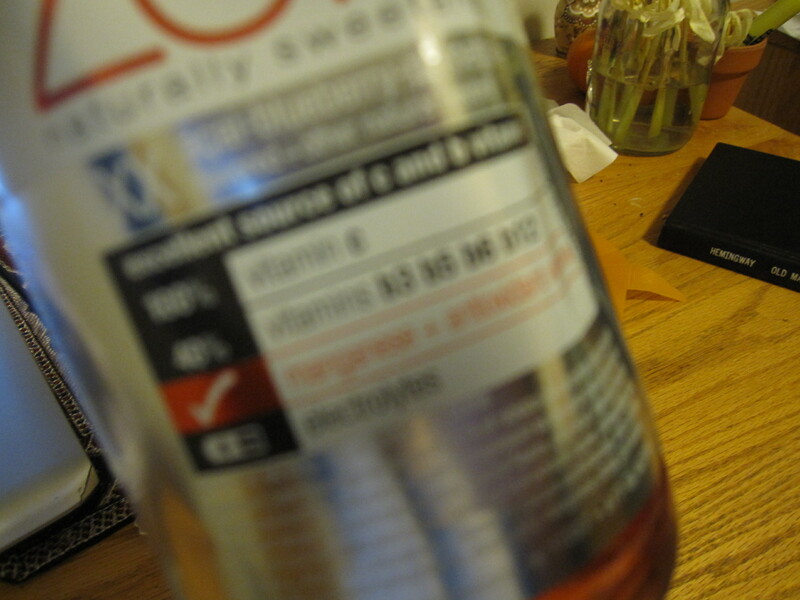 I also had a vitamin water “zero” which was on sale at the pharmacy. It was good but way too sweet. Don’t know if you can read that label, but it says it has electrolytes. It was also sweetened with stevia, which is cool. For the record, the quesadilla was takeout. For some reason I absolutely had to have mexican food tonight, and this hit the spot. Chicken-y, cheesy deliciousness. Mmmmm. I will probably have a bowl of cereal and some chocolate(s) later on,but didn’t want to wait to blog. So there you have it. My long run eats. 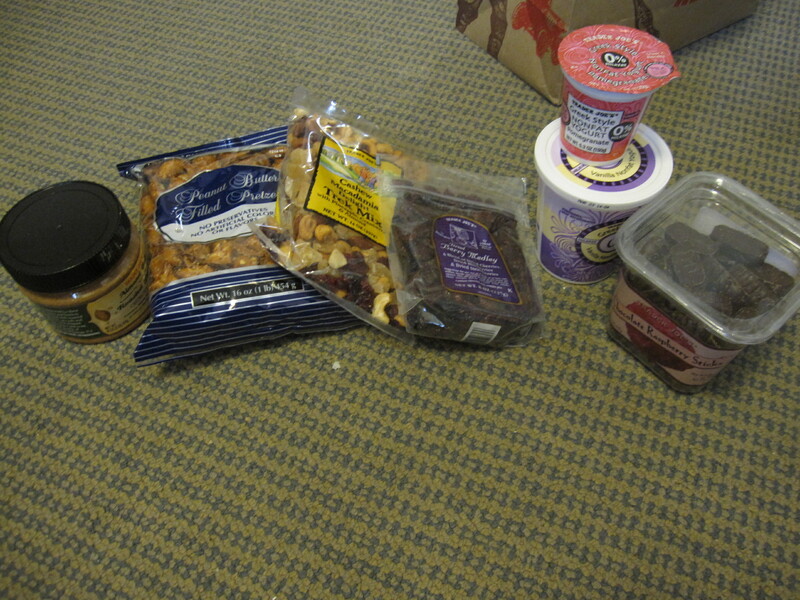 I’ll also show you my TJ’s loot since I totally haven’t talked about food enough in this post. 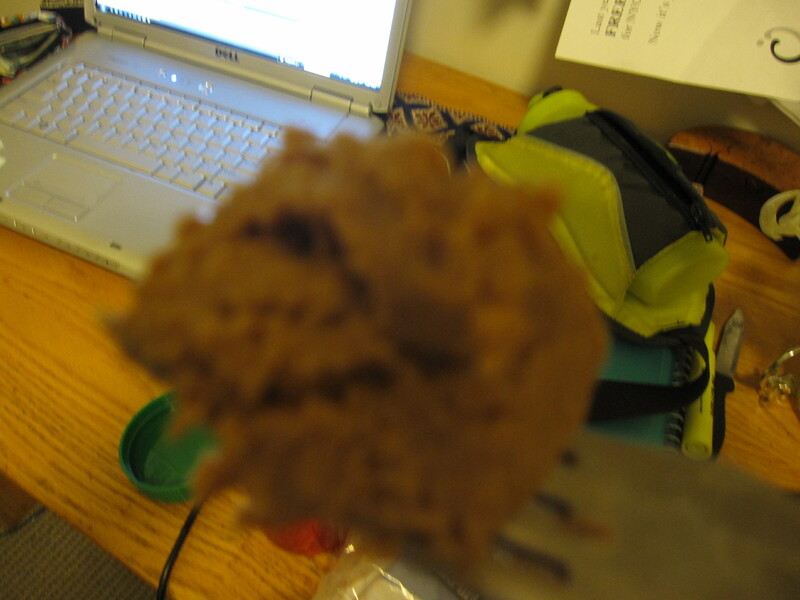 I’m the proud new mama of a jar of TJ’s almond butter with flax! I can’t believe I just said that I was the mother of a food item. Oh well. It shall produce many happy food babies. 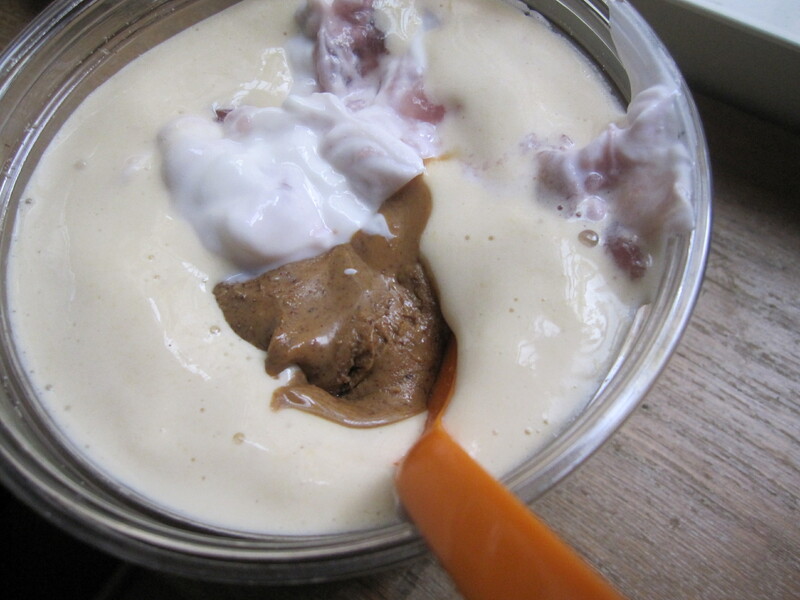 I also procured some Greek yogurt (fyi: their brand is usually relatively cheap), peanut butter filled pretzels, mixed dried berries, macadamia cashew trail mix, and chocolate raspberry sticks (noms all around). 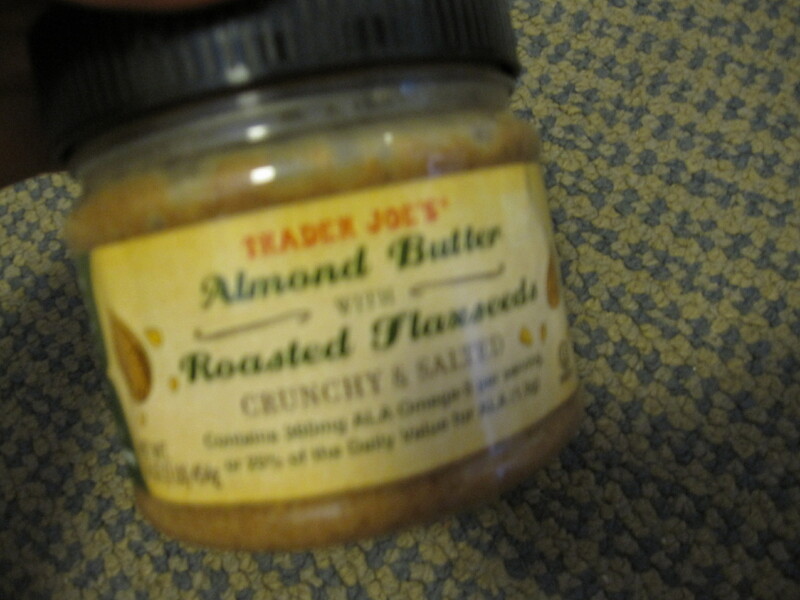 What’s your favorite Trader Joe’s item? Hope everyone is having a fun weekend! What have you been up to thus far?